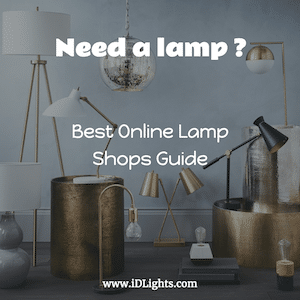 Buying a lamp on the internet is not an easy thing, there are many types of lamps with very different designs … We have selected the main online lamp shops, you will definitely find your happiness! Etsy is a huge marketplace where people around the world connect to make, sell and buy unique goods, and so lamps. In an Etsy Economy, creative entrepreneurs can find meaningful work selling their goods in both global and local markets, where thoughtful consumers can discover those goods and build relationships with the people who make and sell them. Everyone knows Amazon, it is the biggest seller of articles on the internet … And you will find many lamps and accessories, more choices but fewer handmade or design lamps as in previous sites. 2Modern is a leading retailer of modern furniture, lighting, and home accessories founded by Greg Finney in 2003. Independently grown, 2Modern continues to be guided and informed by a passion for authentic, thoughtfully created modern design. The 2Modern team is comprised of people that love the design, with a keen focus on excellent customer service. 2Modern champions the work of 20th Century visionaries as well as emerging contemporary talent, overseeing a curated, accessible collection of beautiful modern design. The Chinese online retailer Alibaba is using AliExpress to expand its reach outside of Asia and challenge online giants like Amazon and eBay. If you’re not familiar with AliExpress, here’s a quick primer: it’s a huge online retailer owned by The Alibaba Group, a multi-billion dollar corporation that started as a business-to-business buying and selling portal. It has since expanded to business-to-consumer, consumer-to-consumer, cloud computing, and payment services, as well.